Over the past two weeks, MSF teams in Libya have observed a sharp increase in the number of people held in detention centres in Misrata and Khoms, following a series of disembarkations of people to Libyan shores. Vulnerable refugees, migrants, and asylum seekers were intercepted or rescued at sea and brought back to Libya in violation of international law. The population in the detention centres in the area went from 650 at the beginning of the year to 930 today. Two days ago, 106 people disembarked in Khoms from a commercial ship. It is feared that at least 6 people reportedly drowned while the group was at sea. “Upon disembarkation, several people were in need of urgent medical care and we intervened to provide medical assistance”, explains Julien Raickman, in charge of MSF activities in Misrata, Khoms and Bani Walid. MSF organized 10 medical referrals to a nearby hospital. Despite this response, a 15 years old boy died later at the hospital. Yesterday, another group of 144 people also rescued by a merchant ship disembarked in Misrata. Among the 250 people who disembarked in Misrata and Khoms, there are women, some of whom are pregnant, babies and young children under 7 years old. They were transferred to detention centres in the area. Days earlier, another 117 people drowned in a separate incident, clearly pointing to a deliberate neglect on the part of European authorities for providing lifesaving search and rescue capacity in the Central Mediterranean. People recently disembarked in Libya are now locked up in overcrowded detention facilities. Capacities to cope with new arrivals are overwhelmed and this leads to further deterioration of already dire detention conditions. The people detained have virtually no access to open air space and little access to clean water and food. Food is insufficient and totally inadequate to meet the nutritional needs of people with serious medical condition, children and pregnant women. Among the people recently disembarked, some suffer from malnutrition, hypothermia, or severe diarrhea. Some report that before trying to cross the Mediterranean Sea, they had been held captive by traffickers for weeks, sometimes months, and were deprived of food and systematically abused and tortured. “People are returned to the country they try to flee, they are desperate. They need to be assisted and protected, not sent back into a cycle of detention” adds Julien Raickman. Women and children in detention centre. Image from September 2018. 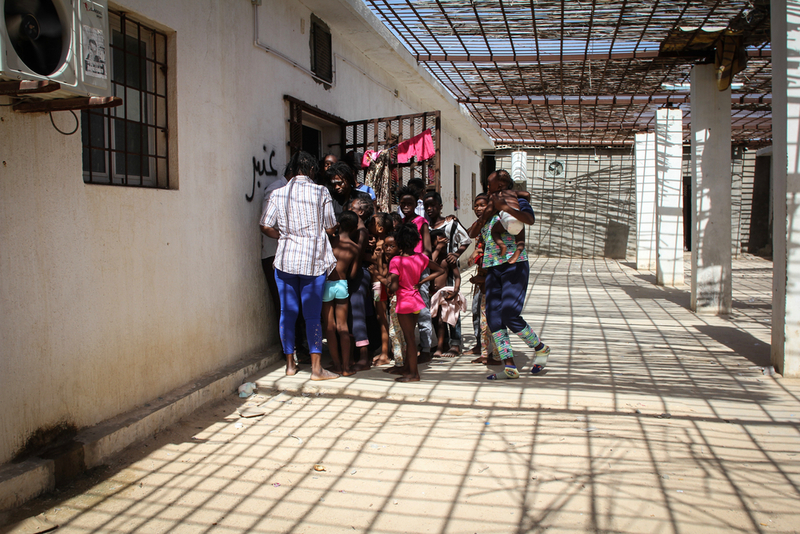 Detention centres in Tripoli are also seeing an increased population. Nearly all detention centres are poorly insulated against the winter weather, resulting in increased morbidities associated with prolonged cold weather exposure. In one detention centre of the capital, MSF medical teams have observed signs of unhealthy weight loss among detainees due to an insufficient food supply. Recent fighting that erupted in southern Tripoli has left 14 dead and 58 wounded according to WHO representatives in Libya. Civilians have at times been caught in the conflict zone, including approximately 228 refugees, migrants, and asylum seekers who are arbitrarily held in the Qasr Bin Gashir detention centre, previously located on the frontlines. Power to the centre’s borehole pump was lost and detainees were left without access to clean water until MSF was able to respond with an emergency provision of water. MSF medical teams have visited the centre twice over the past 48 hours to conduct consultations and provide medication for tuberculosis patients. Libya is not a safe place to return refugees and migrants: the levels of violence they are exposed to while in the country are well documented. 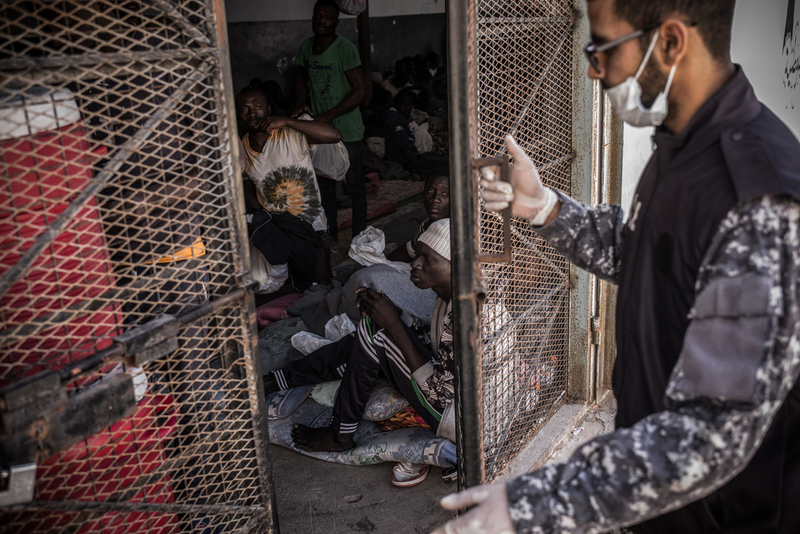 “It is beyond cynicism that the EU and its Member States continue to implement policies based on intercepting and forcibly returning vulnerable people to detention in Libya, while also continuing to deliberately obstruct life-saving search and rescue vessels which are desperately needed in the Central Mediterranean” says Sam Turner, in charge of MSF activities in Tripoli and Mediterranean search and rescue operations.